When we used to think of salsa we thought south of the border. Then something happened. We thought of salsa while we were standing in Tony's kitchen at his 75 year old Hungarian restaurant in East Toledo. Hardly south of the border, but so tequila struck with thoughts of salsa were we, that we threw in some hot hungarian peppers and, well, the results are in this jar. Now you know why at Tony Packo's we say, "Viva Hungaria!" 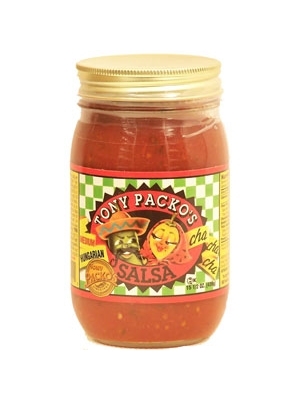 Not your average Cha, Cha, Cha...tangy and spicy with a great tomato taste. Tomatoes, tomato juice, peppers, onions, vinegar, salt, dehydrated garlic, modified food starch, citric acid, calcium chloride, spices.